The following images show some of the special effect that are available under Estierra. Fog Effects. In this image, we are skimming along the cliff faces above the Colorado River and down Glenwood canyon just east of Glenwood Springs Colorado. 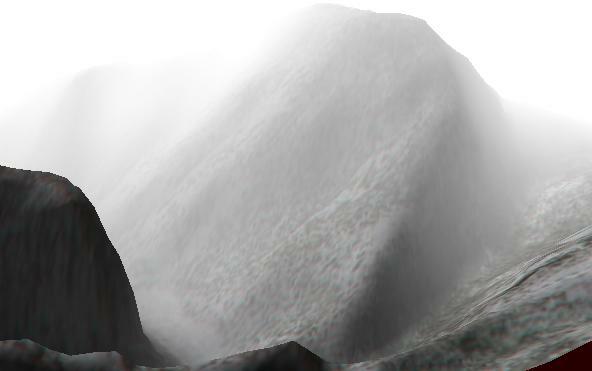 This image show the fog effects available in Estierra. Like real fog, the fog gets denser with distance and as you fly along, distant objects gradually emerge from fog, becoming clearer as you move closer. 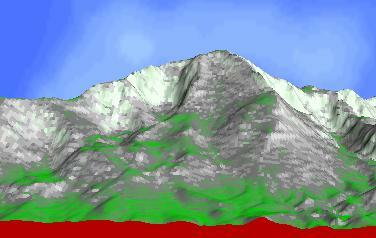 This image shows Pikes Peak in Colorado displayed using the color-by-slope option. The option colors steep terrain light colors corresponding to rocks and gentle terrain greens and yellows corresponding to vegetation. As you can see, this give a very realist image. In fact, it looks very similar to color photo of the actual mountain. To show you how realistic the terrain models can be, here is an actual photograph of Pikes Peak taken from a slightly different angle.